This is my first time to participate in Callapidder Days Fall Into Reading Challenge. 1. Jane Eyre. I DID read this book and blogged about it in Reader's Diary form. You can read my diary of Jane Eyre here. I really enjoyed this book and it fell into the category of Classic Most Enjoyed in 2008. 2. I had hoped to finish Wives & Daughters which I was planning to read with my friend Sarah at Library Hospital. I did complete the book and found it to be a generally positive experience. I also reviewed that book as a Reader's Diary and you can read my thoughts on Wives and Daughters here. 3. I planned on reading Bleak House even though I suspected I would not like Dickens. I was going to give it a whirl all the same. I gave it a whirl and I spun out of control and couldn't finish it. It ended, for me, with a Wikipedia spoiler. You can see my half completed Reader's Diary of Bleak House here. 4. For fun I wanted to read a few Nancy Moser books. I planned to read Time Lottery and Mozart's Sister. I confess I did not make it past the first few pages of Time Lottery. The introduction started with a murder and I just wasn't interested so I immediately set that one aside. However, I did complete reading Mozart's Sister (and liked it!) and you can read that review here. 6. I wanted to read For the For the Family's Sake: The Value of Home in Everyone's Life, by Susan Schaeffer Macaulay in order to focus on home life for a bit. I read that book and you can see my thoughts on For the Family's Sake here. Excellent home making resource. 7. Leepike Ridge and Comstock Lode were on my reading challenge list. I was reading them along with my online bookclub. I read Leepike Ridge and absolutely LOVED it! Fabulous, fabulous book. Can't recommend it more highly. I'm in the middle of reading Comstock Lode right now. On the whole I feel satisfied that I laid out a reasonable challenge for myself. However, I think in someways I was a bit ambitious. Although I gave myself a month to complete the classics, they can really wear you out. I was trying to keep up with other reading projects (some for 5 Minutes for Books as well as some for Reading to Know) and if you pile too much on top of a classic you can grow to resent it. THey are meant to be savored more than I allowed myself to savor them. I have a few classic projects/Reader's Diaries in mind for 2009 but I think I will run them a little differently giving myself time to adequately take them in and enjoy them. I really loved being a part of the Fall Into Reading Challenge. It was my first community challenge and won't be my last (although it could be my only). I like the flexibility it allows for people to create their own To Do reading list, if you will. Thanks, Katrina, for hosting this fun event and I look forward to next year . . . where I hope to be less ambitious! 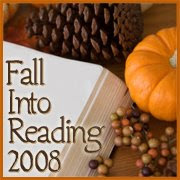 To see how everyone else faired, check out the Callapidder Days Fall Into Reading Challenge end post. You definitely had some lofty goals! I think I set my sights too low this season. I'll post my wrap-up tomorrow. I'm doing my own challenge for the winter, and I've chosen to keep it simple. We'll see how easy it is to comlete (or not)! You sure tackled a challenge with the classics! You made a good dent in them. Please come see my post. What an accomplishment. Congratulations. I am going to attempt more classics in 2009. Joined the casual classics challenge in order to do so. I read jane eyre for lit class and really enjoyed it. You have an interesting assortment of books. If you are up for another challenge, I am hosting winter reading challenge. Wow, you had some hefty ones there! I love Jane Eyre. I want to read Wive and Daughters some time -- loved the DVD. I haven't heard of a few on your list. You had some heavy-duty books on your list. Jane Eyre is a favorite of mine. Great job! I have not read Time Lottery either. Re your comment on my wrap up post! Don't wait to read The Mark of the Lion series. It is so good! So glad you joined us this fall, Carrie. And I completely agree with you about the classics. Personally, I need to space them out and make sure I'm not reading anything else at the time. Congratulations on what you read. A lot of classics, wow. I hear you about the classics. I've been working on Jane Austen's collection since the summer, one more to go. I've taken a lot of breaks between books, just so they wouldn't wear me out.